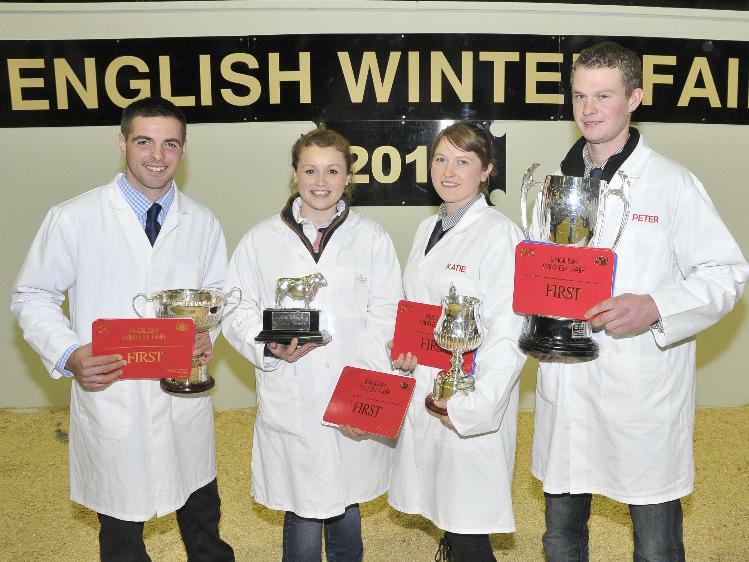 Staffordshire members won four out of the top five trophies at the National Federation of Young Farmers’ Clubs’ (NFYFC) live and carcase stockjudging competitions at this year’s English Winter Fair. 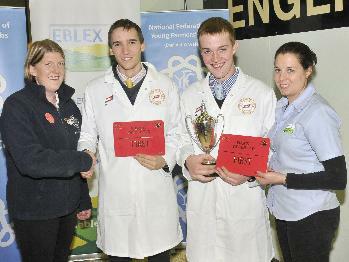 Twenty four teams of Young Farmers from 13 counties across England and Wales competed over the weekend (16-17 November) at the Staffordshire County Showground but it was local members who stole the show. Staffordshire picked up the majority of the top awards – including winning the John Spear Trophy for the first time for being the county with the overall highest marks. 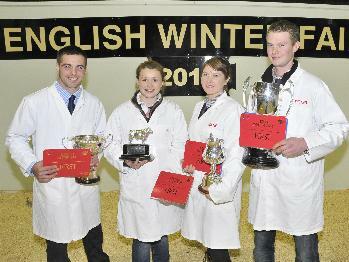 Brother and sister Peter and Katie James from Leek YFC were both in the top team with Harriet Wilson and Matthew Wright from Eccleshall YFC. Peter, who was also in the winning Senior team for the Bob Williams trophy for the highest combined score, said he was delighted to win. Teams from Herefordshire also did well in the competition winning three of the competitions and placing second or third in all other competitions over the weekend. The live and carcase competition, which is hosted by Staffordshire and Birmingham Agricultural Society, is sponsored by EBLEX and is aimed at developing young farmers’ stockjudging skills. The lamb and beef carcases that were used in the competition were supplied by Bradshaw Bros Chase Terrace, the live Lambs came from Madders & Johnson and the live beef from exhibitors at the show. 3. Gwent, Rhys Cooke, Trevor Bowen, Will Probert, Rhys Whittingham. 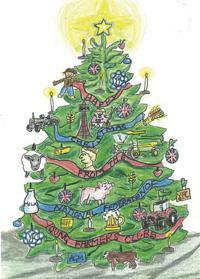 Send some festive cheer to friends and family this year with YFC cards featuring the four winning designs from the 2013 Christmas Card competition – and support two charities! NFYFC will be selling packs of cards, made up of the four different designs created by YFC members and £1 from the sale of each pack will be split between two charities The Farming Community Network and YoungMinds. 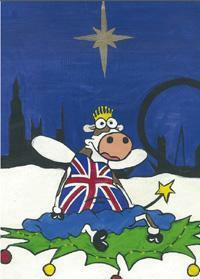 The cards all reflect the Best of British theme and the winner Beth Dennis from Tenbury Wells created an image of a cow wearing a Union Jack, flattening a Christmas tree! In second place was Noelle Supple from Towcester YFC for her Christmas tree design and in joint third place was Sioned Howells from Abernant YFC with a Beeeefy cow and Rachel Smith from Penistone YFC with a sheep theme. The cards will be on sale in the Club Shop from Monday 18 November to purchase. 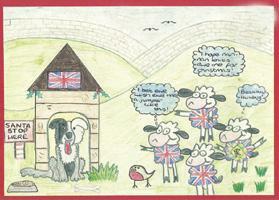 Young Farmers from Worcestershire FYFC have been showing their support for the Back British Farming campaign by helping to create this iconic picture of British Farming. Around 80 YFC members took part in the photoshoot at the Worcestershire FYFC County Office in Hawford. The shoot was organised by the National Farmers Union and the photograph will be used to help remind the country of the vital role farmers play in keeping us all fed. “Young Farmers are vital to the future of the agricultural industry and we wanted to show our support for this campaign which is helping to promote the great work that farmers do, both in keeping the country fed and protecting the British countryside"
“We hope that the flag will engage the public to discover more about British farming and get behind the industry by signing up to the NFU’s Back British Farming charter. “Weeks of preparation were required to map out the logistics of how this could be achieved while just taking up a couple of hours of farmers’ precious time. Red, white and blue produce was brought along by farmers in the picture, and each farmer came dressed in one of the flag colours. As well as Worcestershire FYFC members, the flag picture also includes former NFYFC President, Lionel Hill. To view an interactive version of the picture and watch a video of the making of this iconic image visit the Farming Delivers For Britain website. Young Farmer Sarah Hurford has been named as the winner of the first ever British Grass Farmer of the Future award. 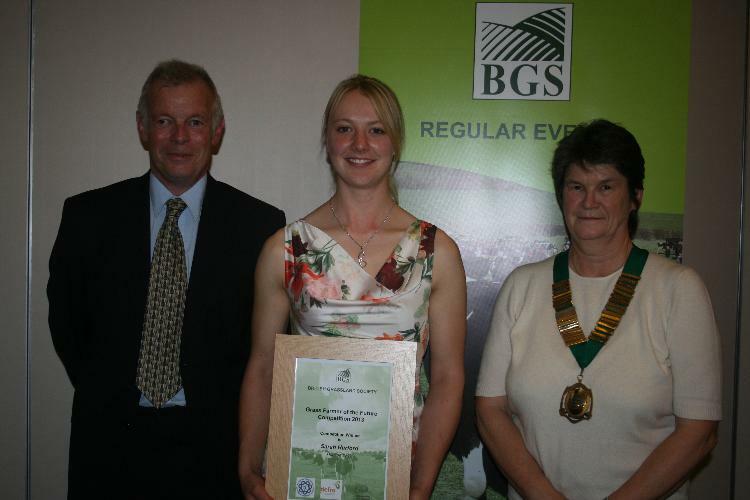 Sarah, who is a member of Honiton YFC in Devon, was presented the award by the British Grasslands Society (BGS), after winning a grassland management competition run by BGS and NFYFC. The competition was part of a new Grass Farming for the Future initiative, which was supported by Defra, and aimed to teach YFC members how to make the most of a cheap and nutritious livestock feed. YFC members visited the farm of Shropshire farmer Tim Downes and learnt about grassland and soil management before taking a tour around his dairy farm. They were then asked to take part in the competition, which challenged them to complete a report on how they would turn around the fortunes of a struggling dairy farm. Sarah has won £1000 worth of scholarships to British Grasslands Society events, which will enable her to increase her knowledge of grassland management. The closing date for booking on a trip with YFC Travel is fast approaching and members need to get applications to NFYFC by Friday 15 November 2013. Trips range from three months in New Zealand working on a farm to a week-long sailing trip for under 18s. NFYFC has provided travel opportunities for members for more than 60 years and so far more than 2,500 members have benefited from the special trips. The travel programme was relaunched this year under the new name of YFC Travel and there has been lots of interest in the diverse range of trips on offer. The trips, which are arranged with the support of the Young Farmers Ambassadors (YFA) and through rural youth organisations around the world, are all heavily discounted and in some cases free due to scholarships. The trip to New Zealand, for example, is free thanks to funding from C Alma Baker Trust, and members will even be paid for working on Limestone Downs farm – an extensive sheep, cattle and dairy farm on the country’s North Island. A homestay to Canada with the Junior Farmers’ Association Of Ontario (JFAO) only costs £63, alongside travel and insurance, and for those wanting a European adventure Austria, Germany, Northern Ireland, Norway, Scotland, Sweden, and Switzerland are all on offer from £32, plus travel and insurance. In October, members also took part in a YFC Travel twitter chat to ask questions about the trips and for others to share their experiences. To see the full list of questions and answers, click here. 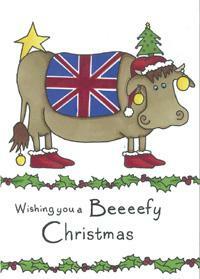 All applications need to be in the NFYFC office by 15 November 2013 – for details on applying click here. All applicants will be invited to a Selection Day on 7 December to be interviewed for a place on a trip. 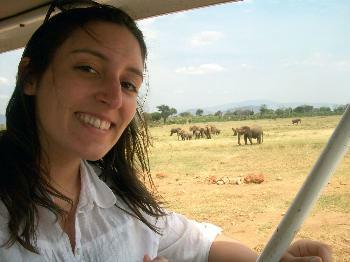 Call NFYFC’s Travel and Events Officer Emily Johnson on 02476 857218 for more information. Members elected a new leadership team at the Council meeting in November, who pledged to reach out to more rural young people over the next year to tackle isolation issues in the countryside. 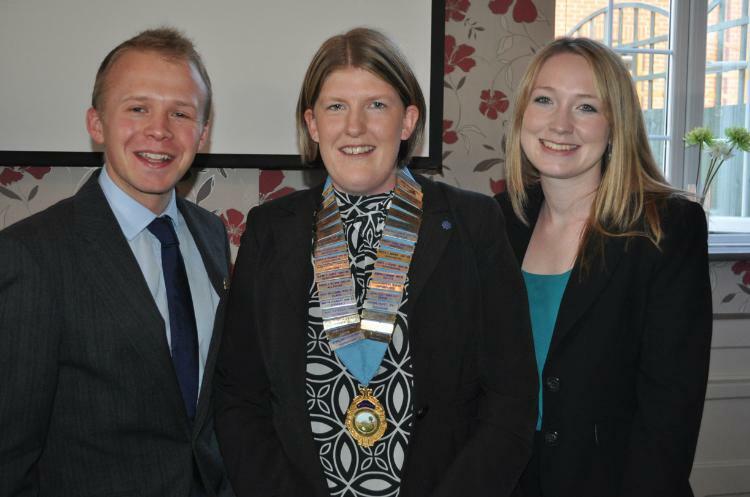 Claire Worden from Lostwithiel YFC, part of the Cornwall Federation of Young Farmers’ Clubs (FYFC) was voted in as the new Chairman of Council and Hannah Talbot from Worcestershire FYFC and Chris Manley from Devon FYFC were elected as the two Vice Chairmen. During her year as Chairman, Claire plans to head up a campaign about rural isolation to help raise awareness about the unique challenges young people face who live in the countryside and to demonstrate the support Young Farmers’ Clubs can offer. Claire Worden, National Chairman of NFYFC, said: “I am honoured to represent such an amazing organisation that has given me so much over the last 13 years of my membership. More than 100 members gathered in Coventry over the weekend to pass motions that affect the running of the organisation and to elect the new Council. Stepping down from her post as Chairman from 2012/13, Milly Wastie said her highlights had included taking part in the Harvest Festival at Westminster Abbey and launching the NFYFC's Drive it Home campaign, supported by NFU Mutual. 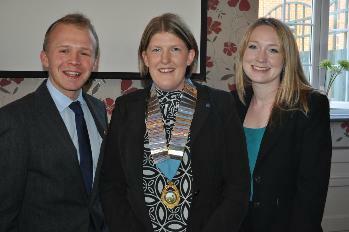 "I have had an enjoyable but challenging year and have put my heart and soul into the commitment as NFYFC Chairman. My legacy will be that road safety will fit into the YFC club programme once a year and NFYFC will help to put together training and resource materials for clubs to run themed evenings." • Anti-bullying and Safeguarding policies to be adopted by the Federation are approved. NFYFC tweeted throughout the Council meeting to keep all members updated on decisions. Counties and clubs actively retweeted content and got involved throughout the meeting. The most retweeted comment was about the Fancy Dress AGM theme for 2014. Four steering groups represent members’ views and include: Competitions; Communications, Events and Marketing; Personal Development and Agriculture and Rural Affairs. The National Council is made up of 63 members, associate members and co-options from across England and Wales and is elected by YFC members to represent views.